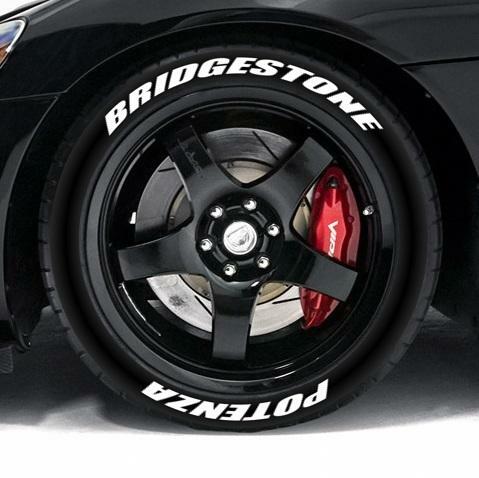 Any of you guy doing the tire lettering on there wheels if so post a picture . Unless my tires are white walls there will be no white (paint) on my wheels. That trend was all over sema, played out imo. PaulMarSS and Glen H like this. I was tempted, but saw some up close (affixed variant) and decided against it. 'Haven't had RWL"raised white letter" tire since my '81 RX7-GSL, and they were oem. My race car in '81 and '82 specd BFG radial T/A tires which were RWL, and my tow car had them, haven't had any since then. 1977 TransAm - Black and Gold Bandit Ed. I am not a fan of raised white letters on my SS, but I like the raised white letters on my 98 GMC daily-driver truck. Must be the redneck in me that likes that look on an "old" truck. SleeperKills, TangoHotel and aussie vf 2 like this. I had some BFG ATs put on my old frontier with the white letters out. I liked it for that application. I would not do it on my car but I have seen an Evo around town that I think it looks good on. I was also in high school when the fast and the furious came out, so maybe I have boy racer tendencies. Local guy has had it a few times on his SS. Not my thing, but each their own. If you google some examples show up. Painted tire lettering typically looks bad and fades fast. Heat press on tire lettering looks much better and should last a couple months at least. I think it only looks good on a well modified car. It looks pretty dumb on a stock height daily.